The John Moores Painting Prize is celebrating its 60th anniversary and holding its 30th exhibition at the Walker Art Gallery in Liverpool in 2018. The anniversary of this prestigious painting is being celebrated with two additional prizes for the first prizewinner (see below for further details). During the last 60 years it has championed contemporary British painting for over two decades longer than any other art prize of similar size. 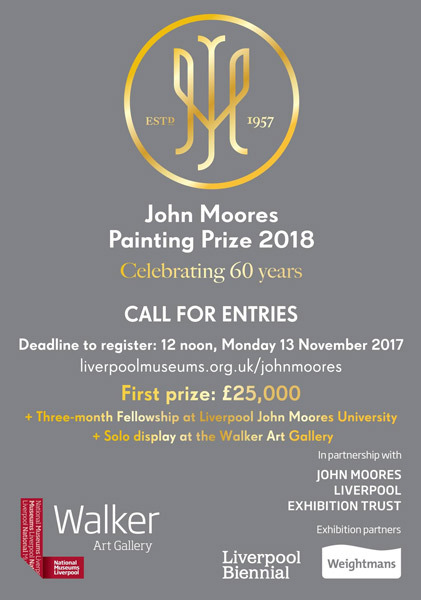 Registration for the call for entries for the John Moores Painting Prize 2018 opened today at 12 midday today, 14 September 2017. Below is an overview of the call for entries and links to relevant webpages. This art competition is a PAINTING competition and is open to all UK-based artists working with paint. It culminates in an exhibition at the Walker Art Exhibition in Liverpool which is held at the same time as the Liverpool Biennial. Its named after the sponsor of the prize, Sir John Moores (1896 – 1993) and was originally intended as a one-off! It's now a biennial event and this will be the 30th exhibition in 60 years - since its launch in 1957.
and after that it's whatever the members of the jury care to place an emphasis on. The Jury changes with every exhibition. They are selected and appointed by the John Moores Liverpool Exhibition Trust and National Museums Liverpool. Bruce McLean - a Scottish sculptor, performance artist and painter who studied at Glasgow School of Art and St. Martin's School of Art. He taught at numerous art schools including The Slade School of Fine Art, where he became Head of Graduate Painting (2002-2010). You can see his work here. In 1985, he won the John Moores Painting Prize. All paintings included in the exhibition are eligible for a prize. The jury will select a final shortlist of five paintings and award the prizes. an in-focus solo display at the Walker Art Gallery in 2019. In addition, the prize is NOT a purchase prize, but the Walker Art Gallery may also purchase the painting which means another 'win' for the First Prizewinner. There is also a Visitors’ Choice prize of £2,018, voted for by visitors to the exhibition at the Walker and awarded towards the end of the exhibition period. These are the Terms and Conditions and FAQS and Commercial Agreement on which I have based this summary. I do NOT warrant that I've covered every detail you might need to know - it's up to you to read all of these documents thoroughly and make sure you can comply with them when you send in your entry and painting. You can submit only one entry per artist. Multiple entries under the same or under different names are not allowed. Artists found to have done this will be deemed in breach of the Prize’s conditions of entry and will have all their entries disqualified. a new or recent work, preferably created since 1 January 2016.
wholly or partly executed in any painted medium. designed to hang on or be fixed to a wall. Undertakes that the work submitted is of their own origination, and that they hold all moral and intellectual property rights in that work. For example, if your work is closely based on the work of another artist, you must have obtained all the necessary copyright permissions and credit lines and paid any fees due before entering (registration and payment). be available for Stage 2 of the competition and, if selected, for the duration of the exhibition itself. When packed for transport, must measure no more than 3m x 3.75m. When unpacked, must project no more than 0.5m from the wall. If made up of more than one piece, such as a diptych or triptych, must be no larger overall than 3m x 3.75m x 0.5m when displayed on a wall. £30 inclusive of VAT (non-refundable). Payment should be made online by debit/credit card via the John Moores Painting Prize webpage. There are three main stages: Call for Entries, Stage 1 and Stage 2. Registration and Submission of a digital image of the painting have the same deadline. The first stage of selection is entirely based on the image submitted. Digital images of the submitted work must be JPEGS between 2MB - 5MB in size and a minimum of 1000 x 1000 pixels. One image showing the complete painting must be submitted (A). An optional second image, showing a detail of the work, may be submitted (B). The image(s) of the painting must not be manipulated in any way and must be of the painting entered. Substitutes cannot be accepted and will invalidate the entry. Artists are notified as soon as possible after the Stage 1 selection about whether they have been selected for Stage 2. The exhibition organisers arrange the transport of paintings to Liverpool for judging. Each painting is viewed and discussed individually by the jurors who then select the works for the final exhibition. Jurors are not given the names of the artists but have access to the following information: title, size and medium. However, in addition and on request, they have access to the artists’ statements about their work (but not their biographical information). Jurors also decide the prize-winners. If selected for the exhibition, agrees to the reproduction of their work or a detail of the work (at no fee) in association with the exhibition, including press, marketing, publicity, merchandise, catalogue and postcards and online (including the website and social media platforms). give the Licensee the right to manufacture and sell merchandise (in such forms as it chooses) representing the artwork within the retail outlets at National Museums Liverpool including its online store - subject to agreement to be faithful to the work. The artist agrees to waive any royalty rights for the duration of the period quoted in the agreement. accept that if shortlisted the submitted artwork must be available for sale for the duration of the exhibition and that the Walker Art Gallery, if it requests to do so, is given first option to purchase that work. accept that if selected for the exhibition any sale of the exhibited artwork during the exhibition period will be exclusively undertaken by the Licensee and must not be reserved for sale or sold by any other means. John Moores 2018 will be a key strand of Liverpool Biennial’s 10th international festival which launches on 14 July 2018. The John Moores Painting Prize 2018 Exhibition will be on display at the Walker Art Gallery in Liverpool from Saturday 14 July to Sunday 18 November 2018. I've not covered every exhibition or every stage of this competition. Below are the posts I have written in the past.